The American Emu Association has state and regional affiliates to support members on a local level. Your AEA membership will also give you membership in your state affiliate. If you do not have a state affiliate you will be deemed a member at large. Your AEA and Affiliate membership year is effective on the date of receipt of your application and runs until the end of that month the following year. All fees are quoted in US Dollars. The AEA reserves the right to approve or refuse membership in the Association. Questions? 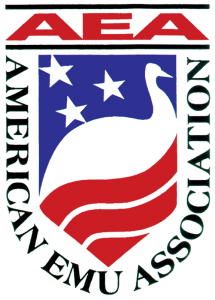 The American Emu Association is a national, member driven community dedicated to developing structural support and visionary leadership for the emu industry through actions that develop public awareness of emu products and develop means to advance the growing emu industry. To be familiar with the purpose and objectives of the Association and to promote its aim actively. To present conduct that in all times reflects dignity and respect for the Association and other members. To keep inviolate any confidence that may be entrusted to said member. To refuse participation in questionable enterprises and to refuse to engage in any business that is contrary to law or public welfare. To guard against unwanted insinuations that reflect upon the character or integrity of others members, officers or staff of this Association. By submission of this application, I agree to abide by the above Code of Conduct. You may apply or renew online using a credit card or paypal. If you are not comfortable using the online form, use the printable Application for AEA Membership – Print and mail with check or money order. Application Requires (free) Adobe Acrobat Reader to open. Attention!!! Canadian Emu Growers ~ Ask about our SPECIAL Limited Promotion for our Canadian Neighbors. Please Note: International Members are NOT eligible to be a Certified Business Member (CBM) or to be listed on the Breeders List. Other restrictions may also apply. Please Note: At this time the AEA is not accepting international memberships from India. If you are a current member of AEA please sign-in to the website first so that your membership is correctly processed to your current account. Please do not renew more then one membership at a time. So How Do They Like This Weather?